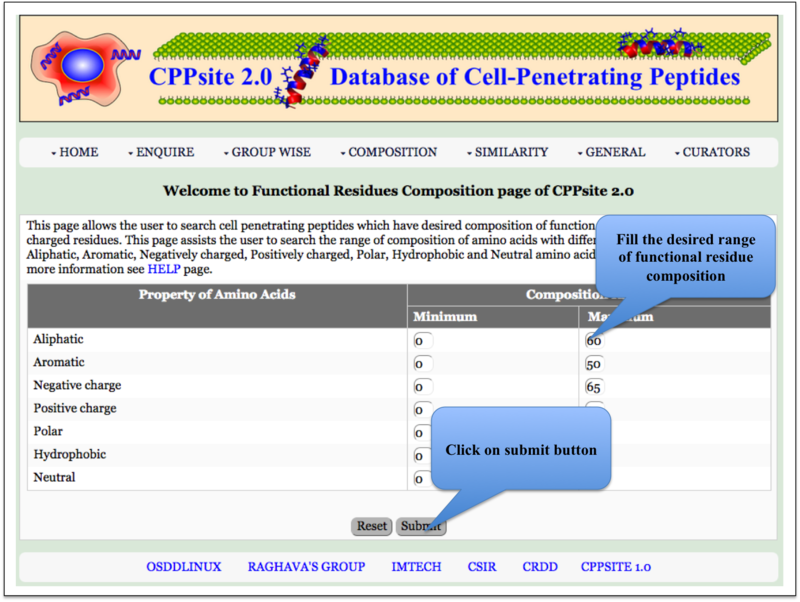 This page provides help to the users of CPPsite 2.0 on how to effectively use this dataset. 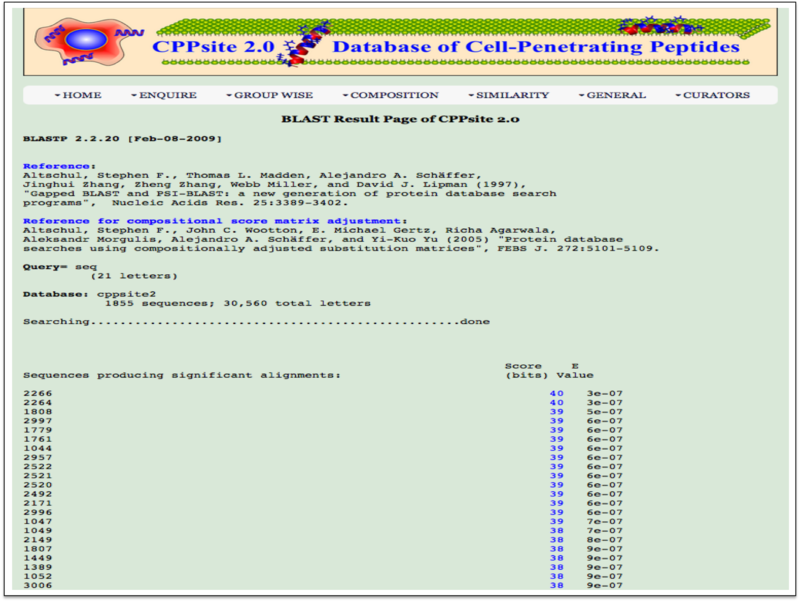 For each module which is implemented in CPPsite 2.0, here we provide the figures and description on how to use that module. A user can click on the links given below to get help of the respective modules. 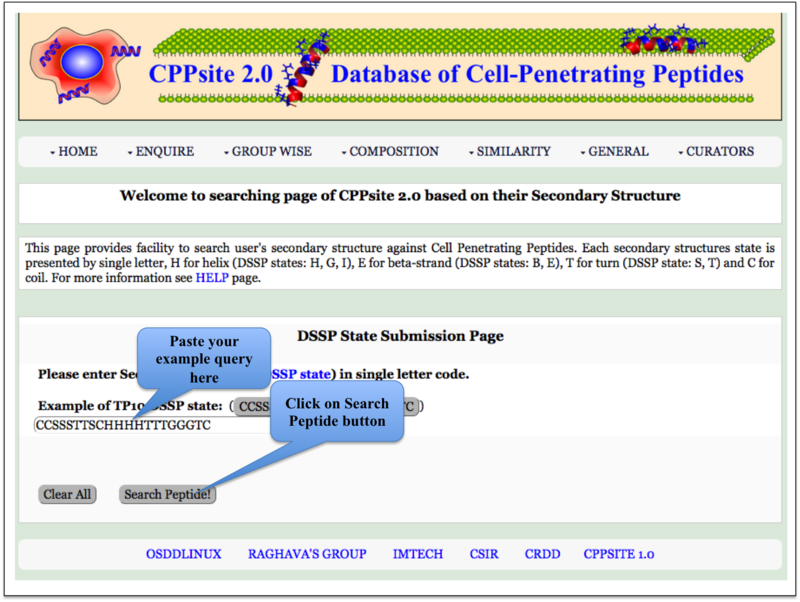 This module displays the simple search page of CPPsite 2.0. Clicking on the required field will allow the user to browse the specific information in the database. 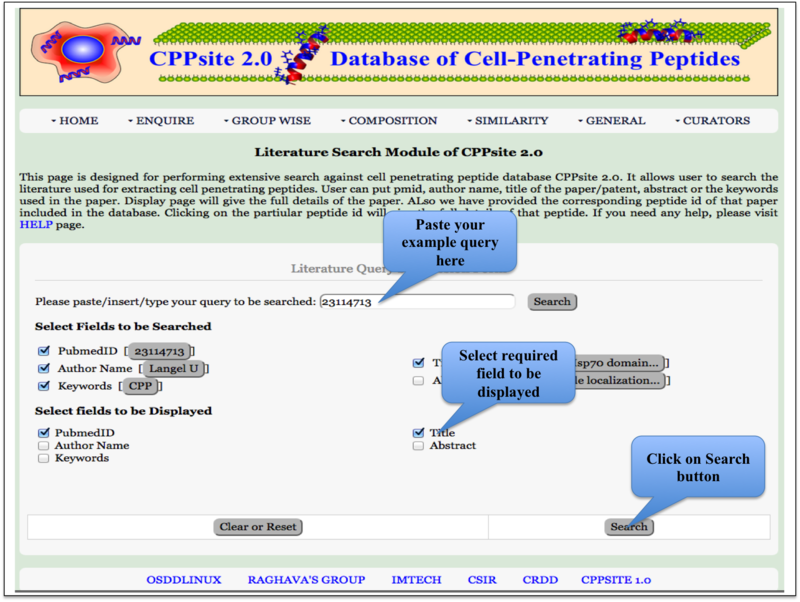 This page provides the faciltiy to search CPPs by author name, title of the paper, abstract, keywords, etc. User can submit its query sequence and search it in the database. 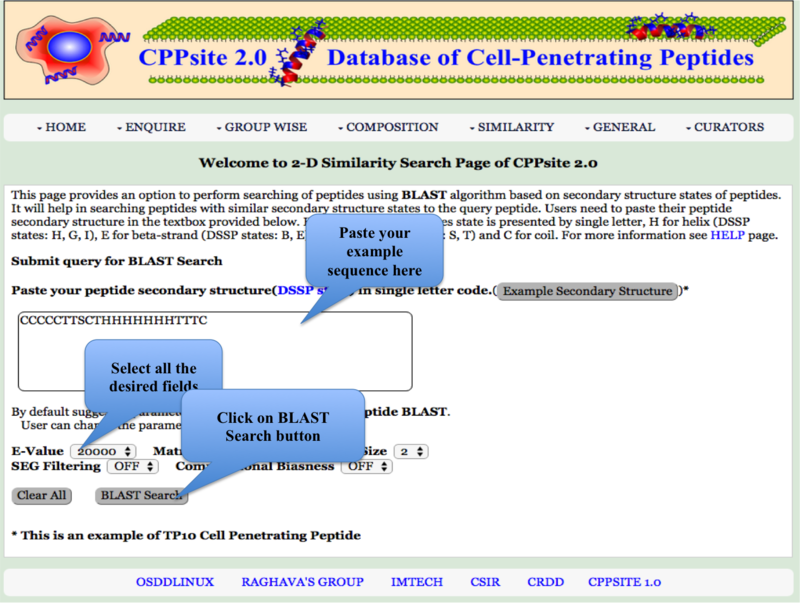 This page provides the advanced search facility in CPPsite 2.0. User can browse the page by selecting two or more than two fileds. 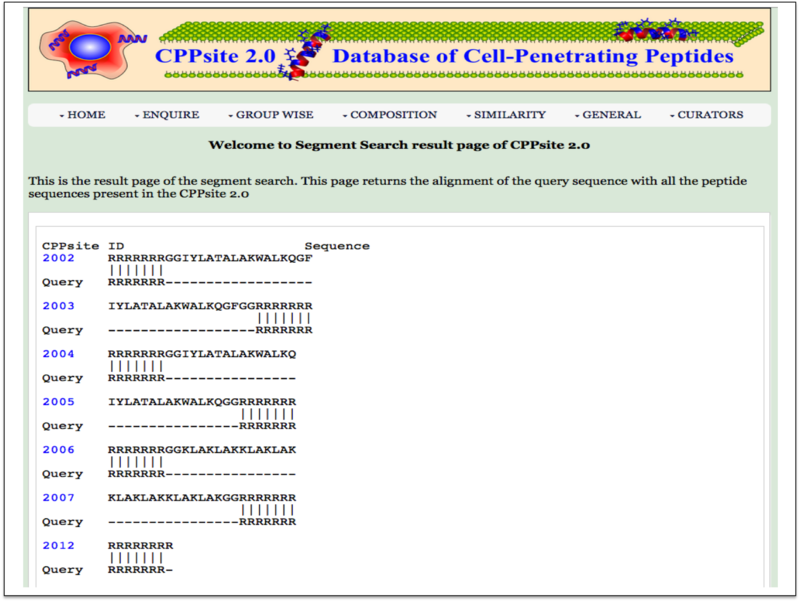 This page provides facility to search his page returns the alignment of the query sequence with all the peptide sequences present in the CPPsite 2.0. 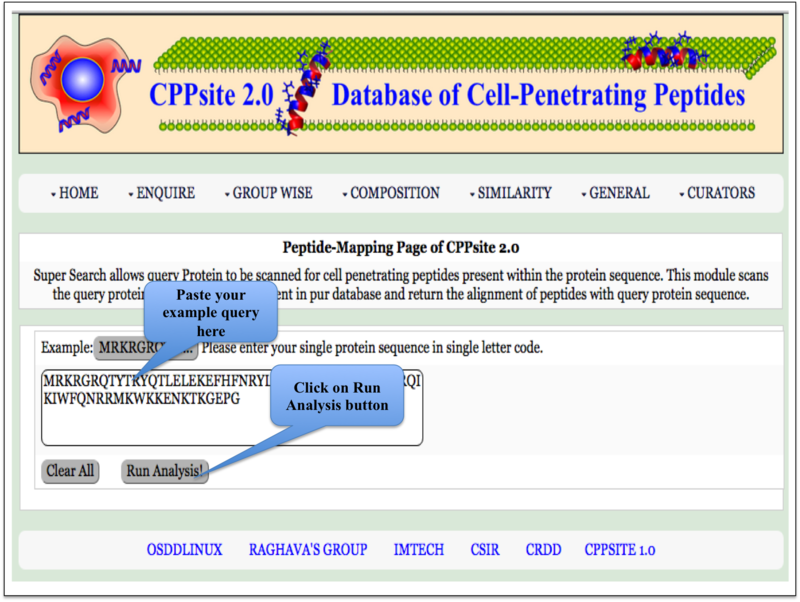 This page provides the facility of mapping the given query sequence with the cell penetrating peptide sequences present in the database CPPsite 2.0. 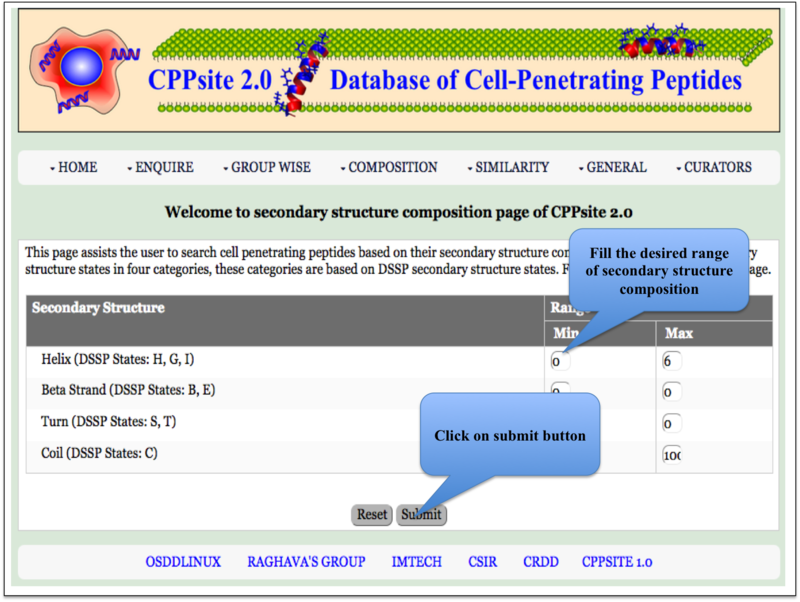 This page provides the faciltiy to search user's secondary structure against CPPs. User can submit its query sequence and search it in the database. 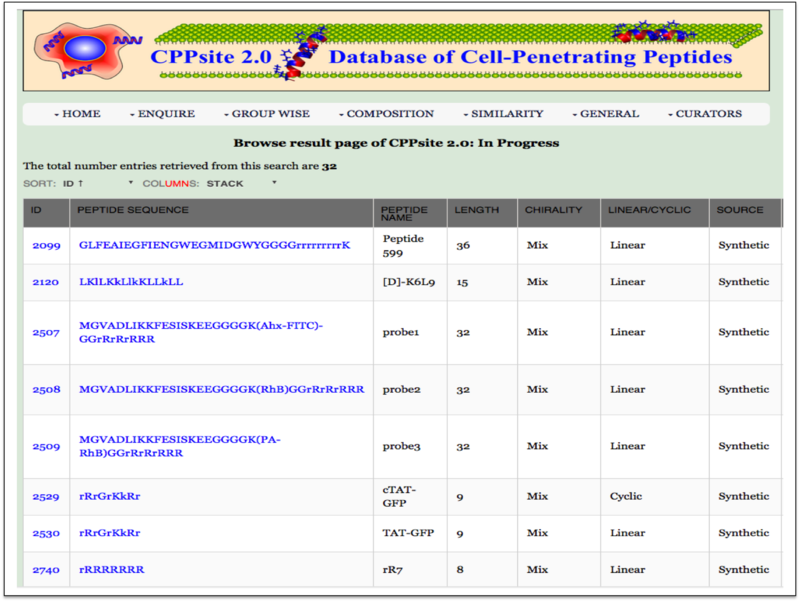 This module displays the peptides of different length, present in the database. 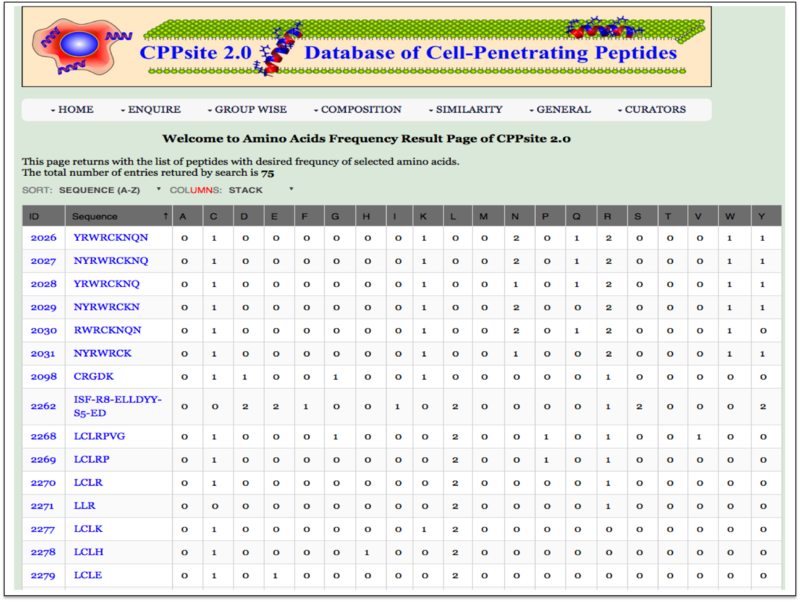 Clicking on number gives the details about the type of peptide selected. 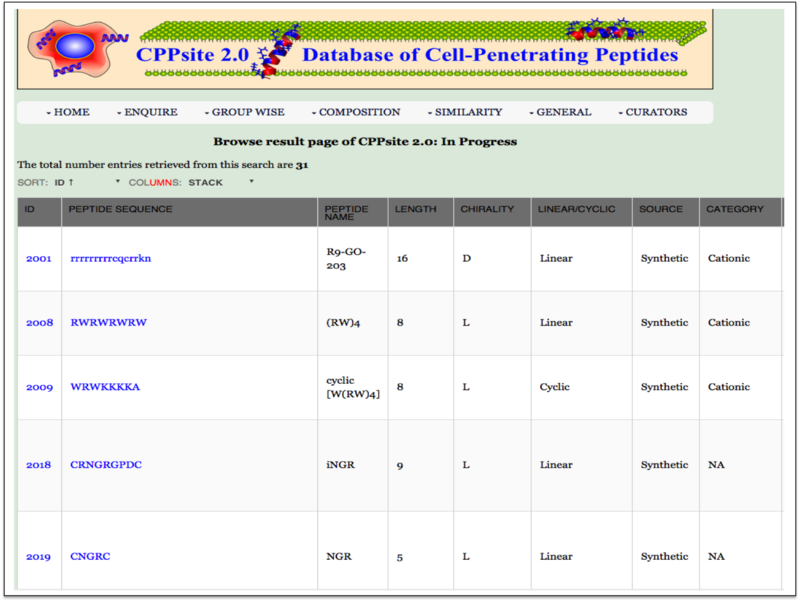 This module displays the category of peptides present in the database. 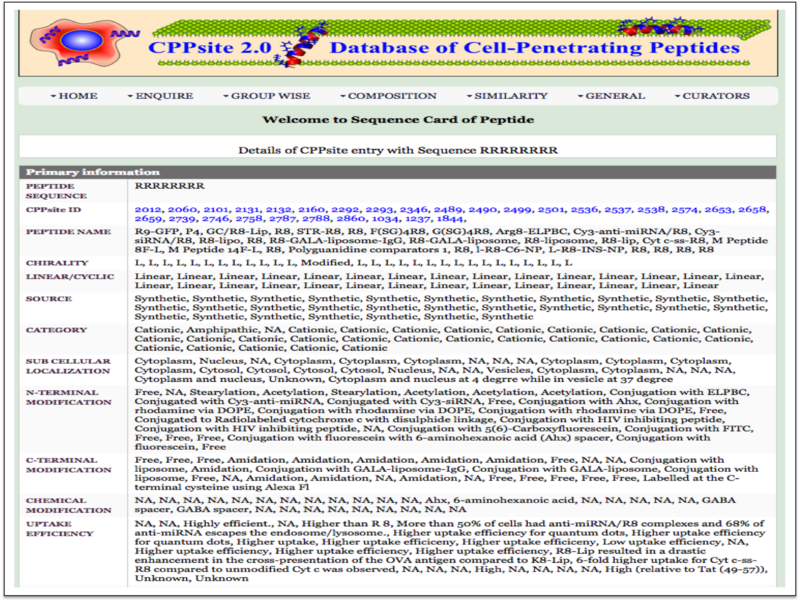 Clicking on number gives the details about the type of peptide selected. 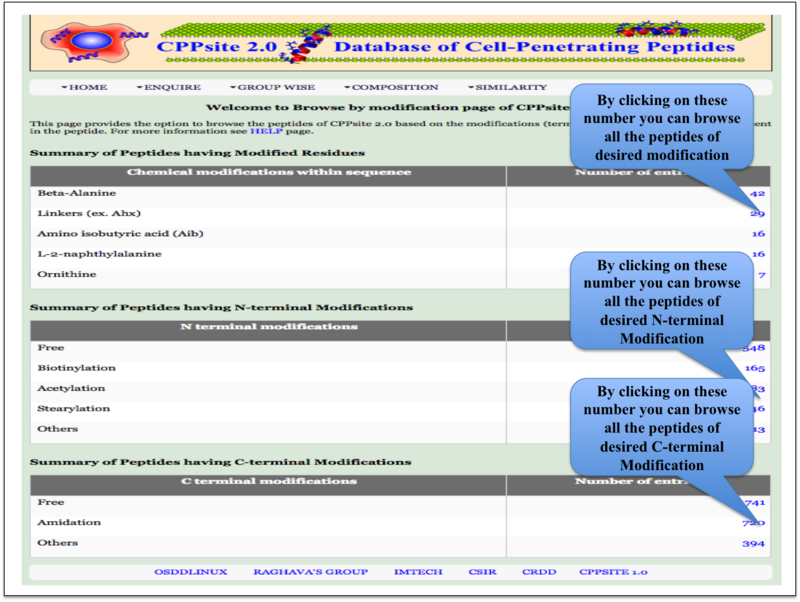 This page provides the distribution of different modifications (Terminal modifications, Various chemical modifications) present in the peptides of CPPsite 2.0 database. This module displays the types of cargoes delivered with the CPPs. 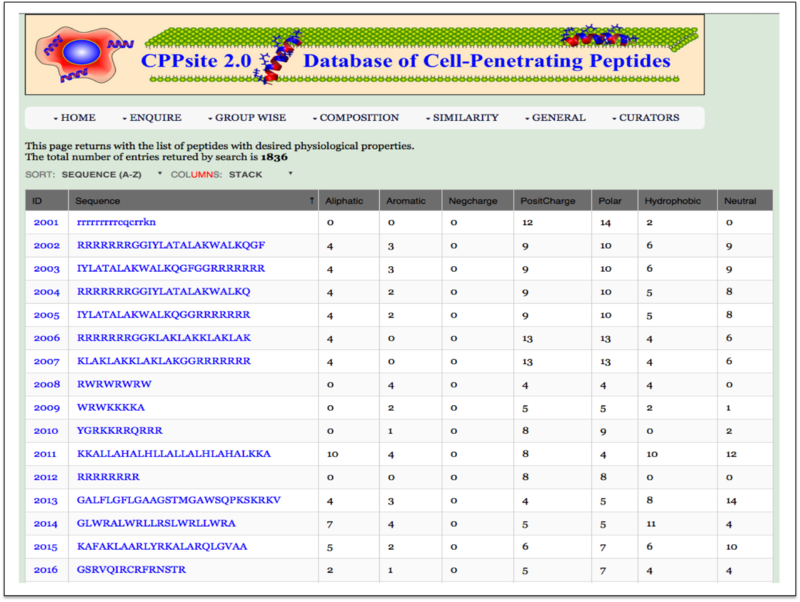 Clicking on number gives all the details about the particular cargo present in the database CPPsite 2.0. 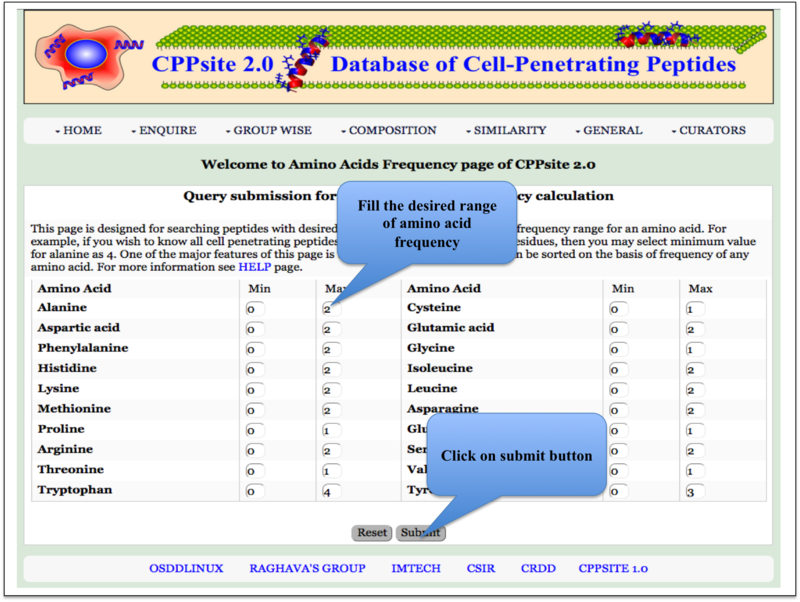 Here the user can browse the peptides based on the frequency of amino acid. 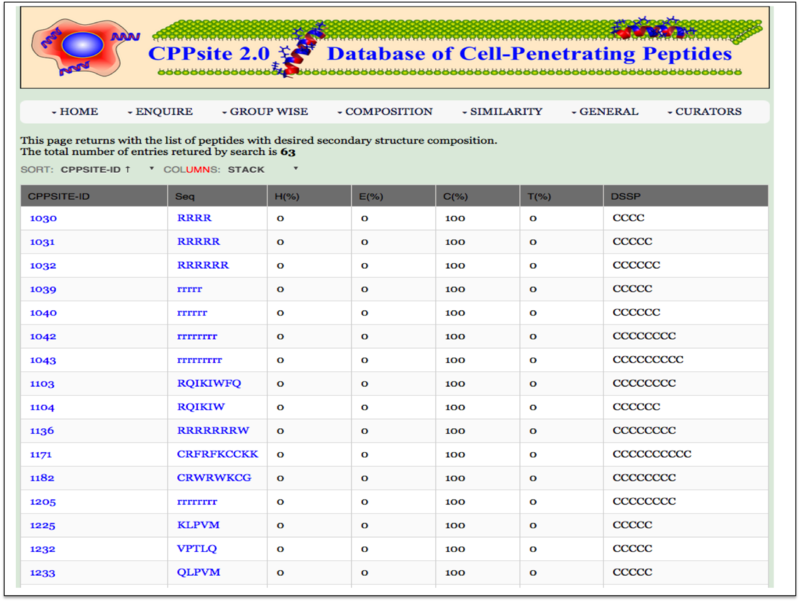 Here the user can browse the peptides based on the frequency of physiochemical properties. 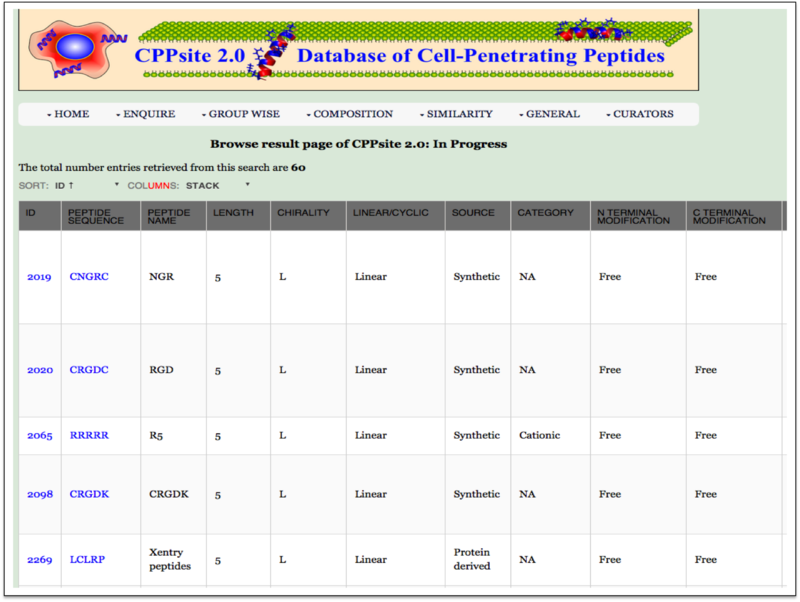 Here the user can browse the peptides with desired amino acid composition. 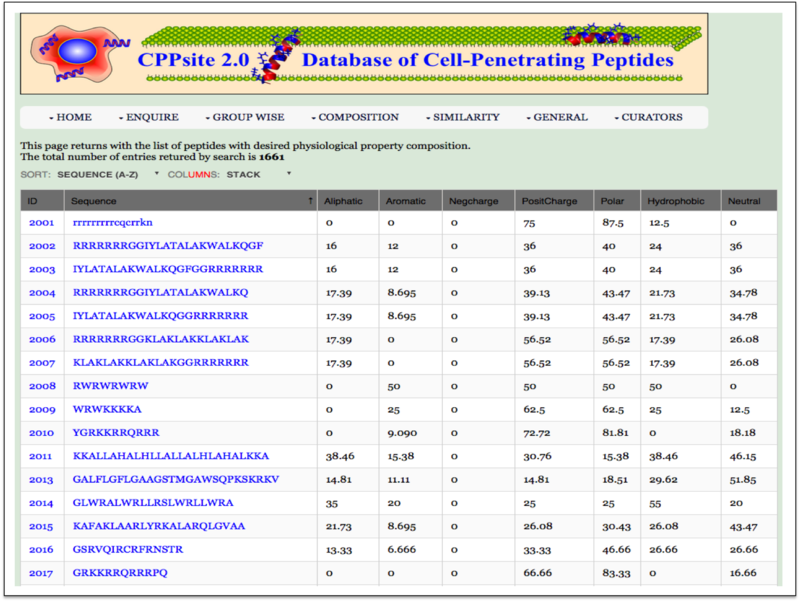 Here the user can browse the peptides with desired physiochemical composition. 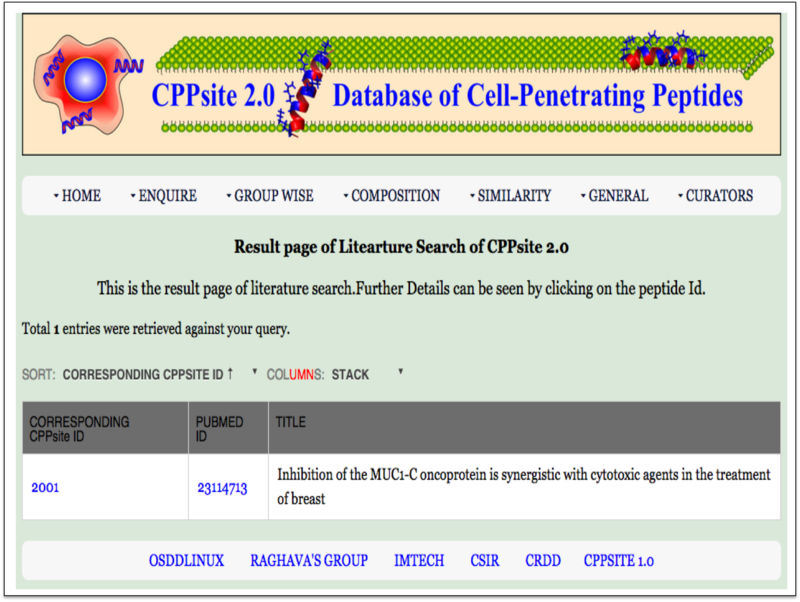 This page assits the user to search cell penetrating peptides based on their secondary structure composition. 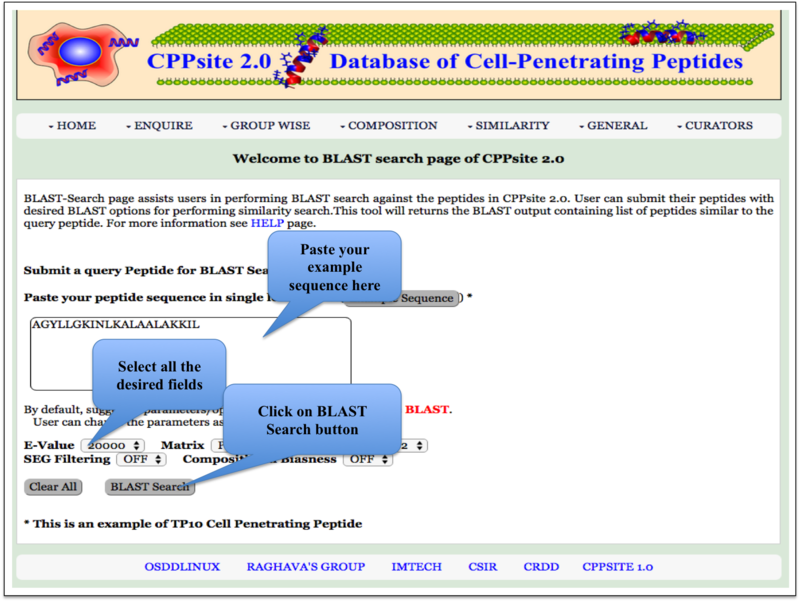 Blast-Search page assists users in performing BLAST search against the peptides in CPPsite 2.0. 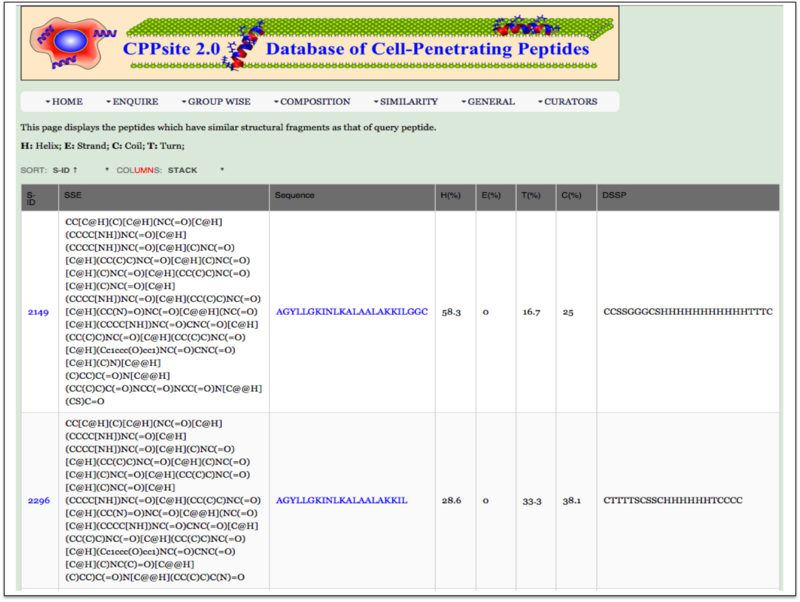 User can submit their peptide with desired BLAST options for performing similarity, server will returns the BLAST output containing list of peptides similar to the query peptide. 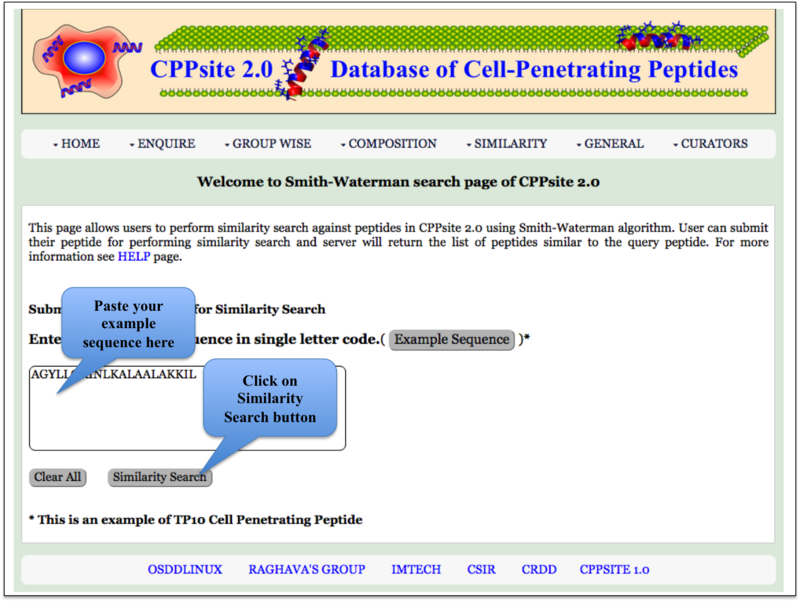 This page allows users to perform similarity search against peptides in CPPsite 2.0 using Smith-Waterman algorithm. 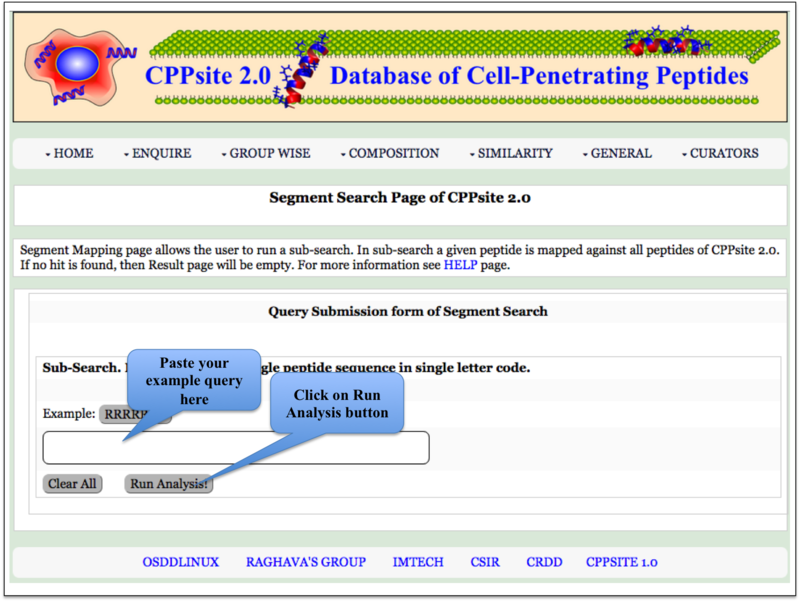 User can submit their peptide; server will returns the list of peptides similar to the query peptide. This module had been designed with the aim to provide virtual screening facility to scientific community. 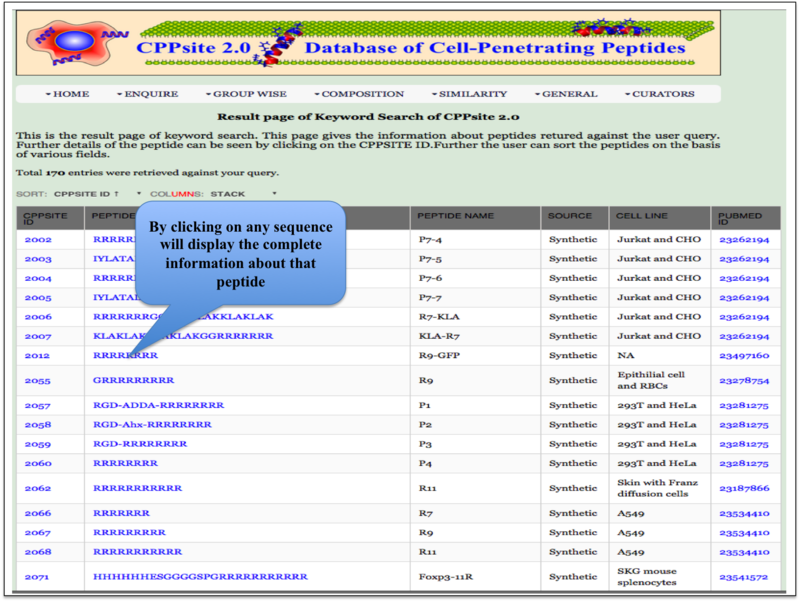 Using this tool, users can screen their peptide library and identify similar or exact peptides from various databases. 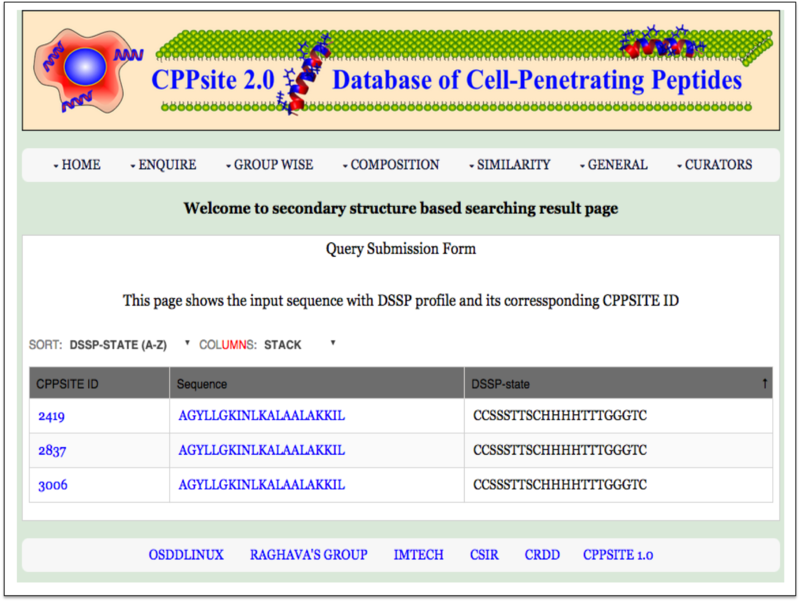 The input for this module could be provided by 1) pasting the peptide structure in defined text area OR 2) Upload the structure file in standard PDB format. 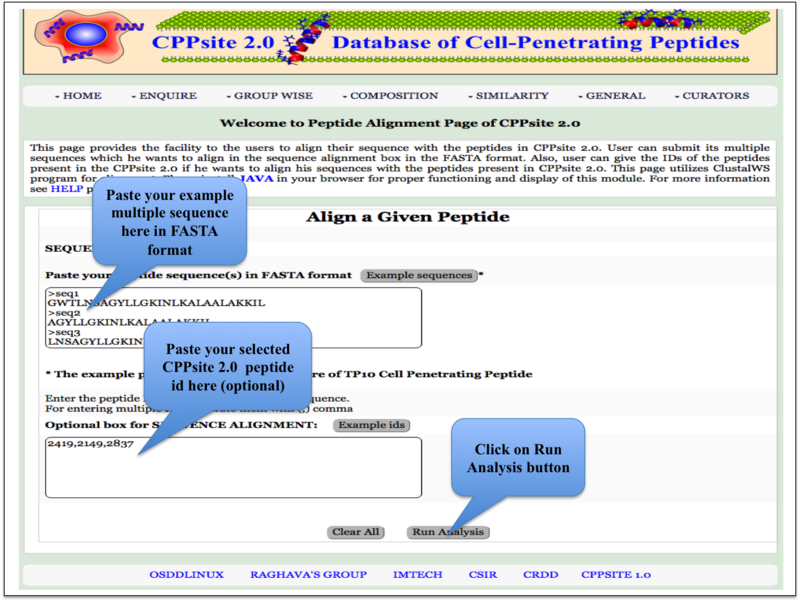 This page provides the facility to the users to align their sequence with the peptides in CPPsite 2.0. 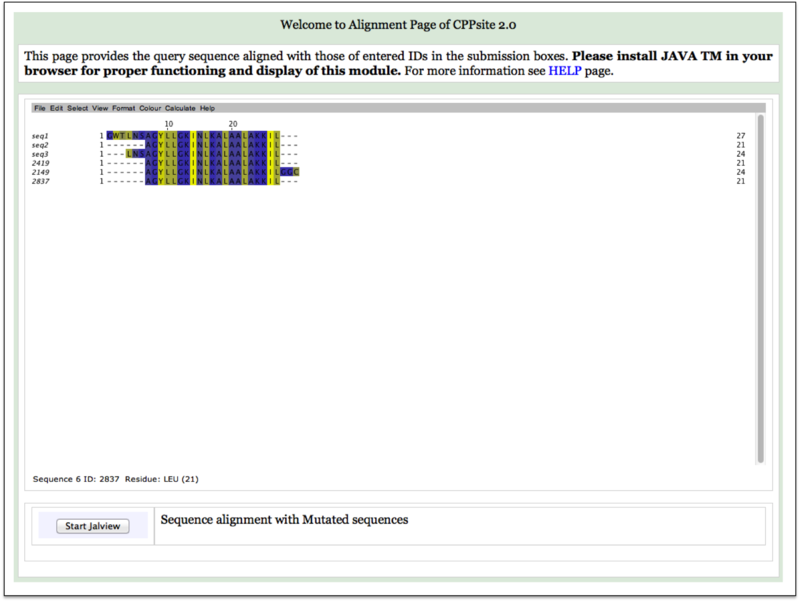 A user inputs multiple fasta sequences in the sequence box and peptide ids of CPPsite-2 in the id box, and gets aligned sequences. Q1. 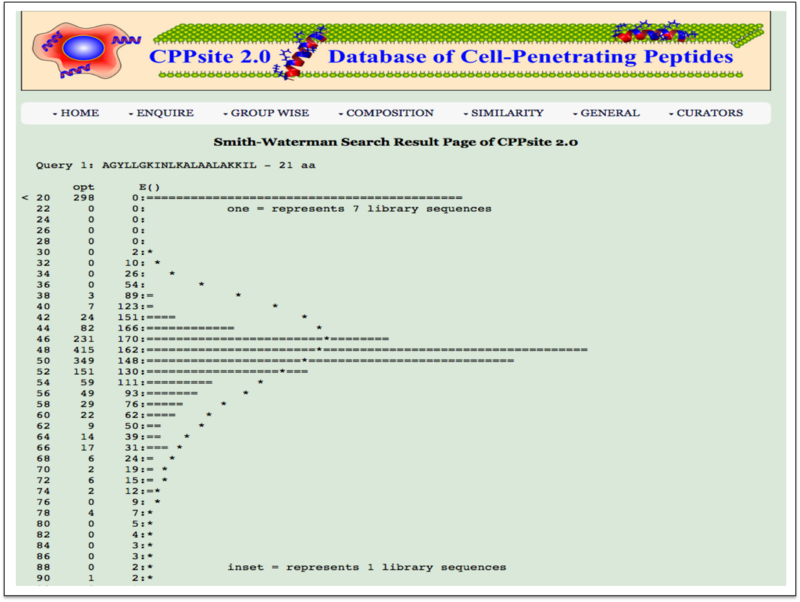 What is CPPsite 2.0? 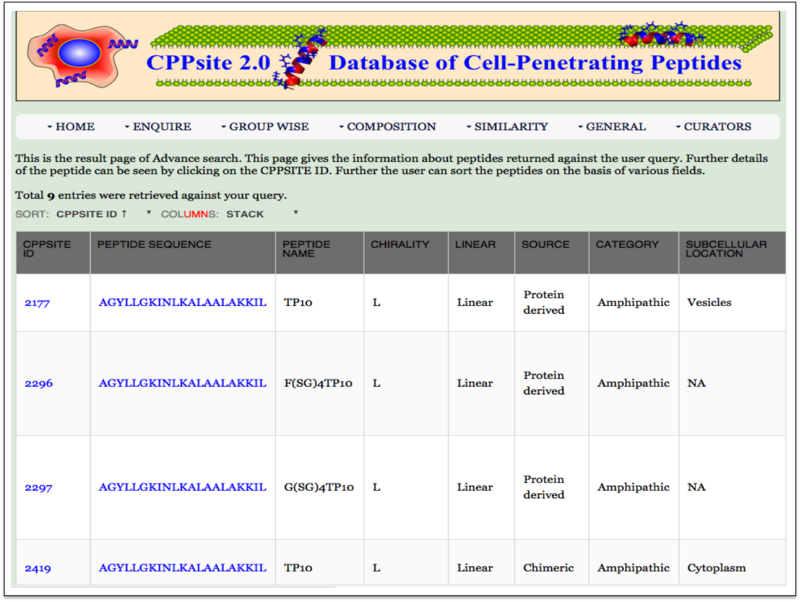 Ans .CPPsite 2.0 is updated database of cell penetrating peptides. Ans. It comprising peptide entries from the literature available on Pubmed and patents. 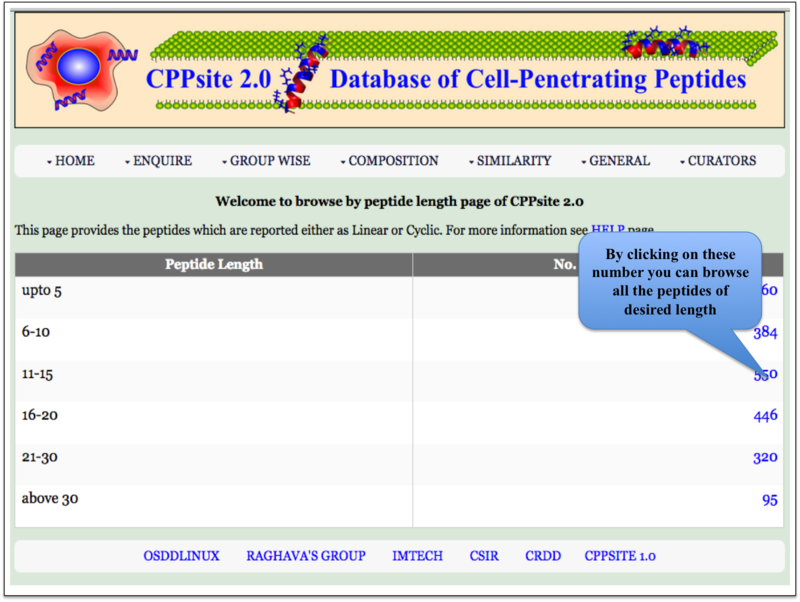 It will give all the information about the cell penetrating peptide. 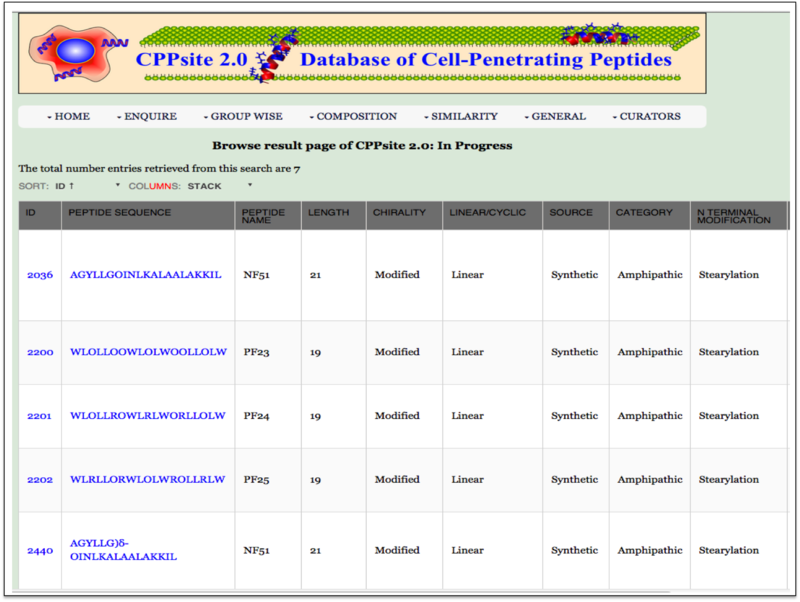 this database will give information about the various modifications done on the CPP and the different types of cargo molecules attached to it for delivery into the cell.This database will helpfull to design novel therapeutic approach. Q3. 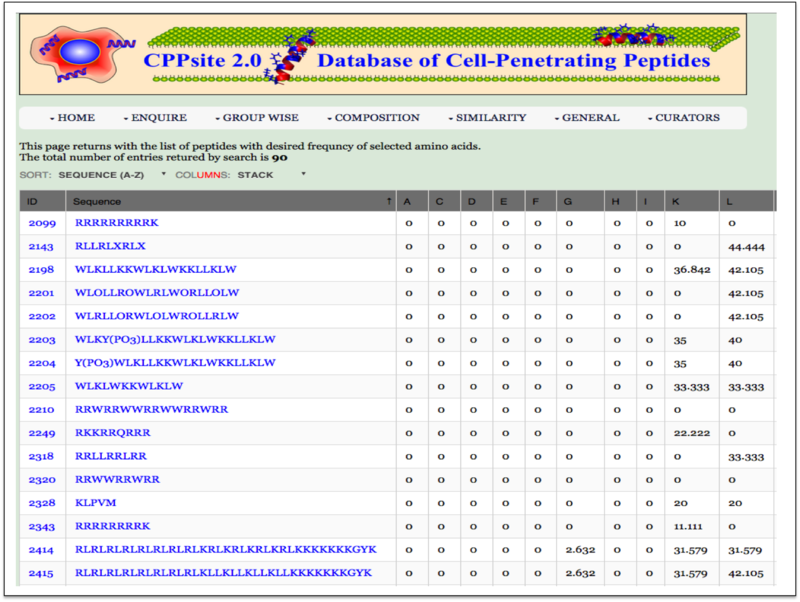 How to search into CPPsite 2.0? Ans. 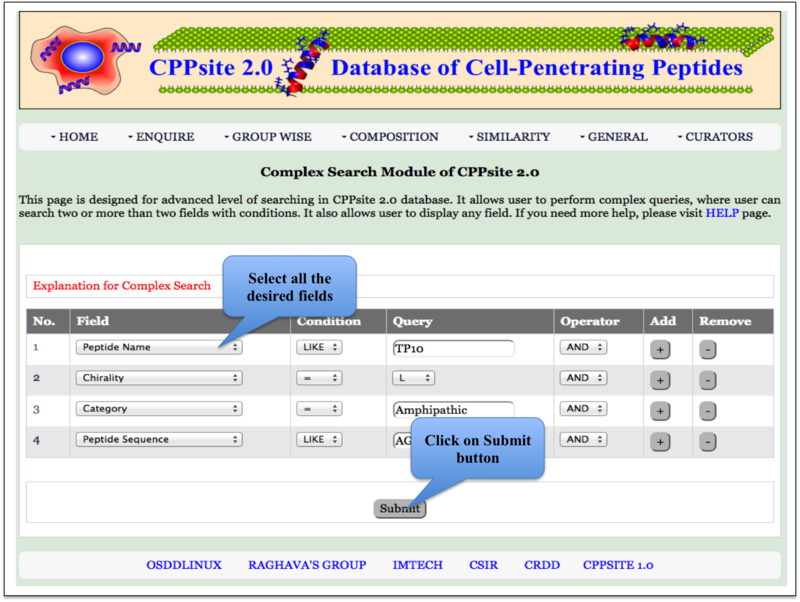 A user can perform sequence or secondary structure-based searching to identify identical/similar entries present in all the peptide databases integrated in CPPsite 2.0.